FITNESS REALITY. Real People. Real Results! The Fitness Reality E5500XL Elliptical gives you all the workout programs you need, to track your results. 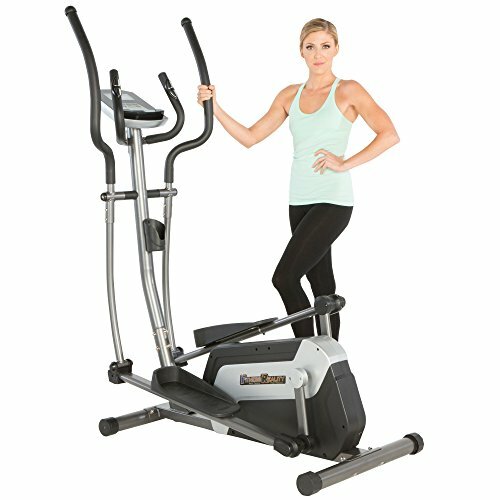 The smooth 18″ stride, 24 levels of resistance and the smart target control computer will give you any exercise challenge you want. Heart pulse sensors will target your heart rate zone and the E5500 is designed to be much more compact than other elliptical trainers. So give the Fitness Reality E5500XL a try and be on your way to healthier life. Features: Extended user weight capacity of 270 lbs. 24 levels of smooth Magnetic Tension resistance. 3 Computer goal workout settings: distance, time and calories burned. Recovery feature provides heart rate evaluation after workout. A special engineered sleek and slim design provides the most natural stride motion. Dual action handlebars provide a complete upper body workout. Double Transmission operates with a consistent 2 flywheel and 2 belt design system. A Double Transmission system results in increased momentum and a smoother striding motion. Double Transmission utilizes a compact design that reduces the overall size of the elliptical trainer. A strong and durable 3 piece cranking system for high end performance and continuous momentum. Hand Pulse Sensors allow you to monitor your heart rate. Smoother than most single flywheel elliptical machines. The larger stride pedal design prevents any foot slippage when exercising. Built in transportation wheels for easy relocation. Extended leg stabilizers prevent any movement or tipping when exercising. The distance between the two pedals is only 6″ so there is no strain on the inner thighs. The lowest position of the pedals are only 6″ off the ground providing safe on and off capability. Mobile phone/tablet holder included. Water bottle holder included. AC adapter included. Some assembly is required. Product Set up Dimensions: 57.5″ L x 24″ W x 66″ H. Product Weight: 93 lbs. Warranty: 1 Year Limited Warranty.